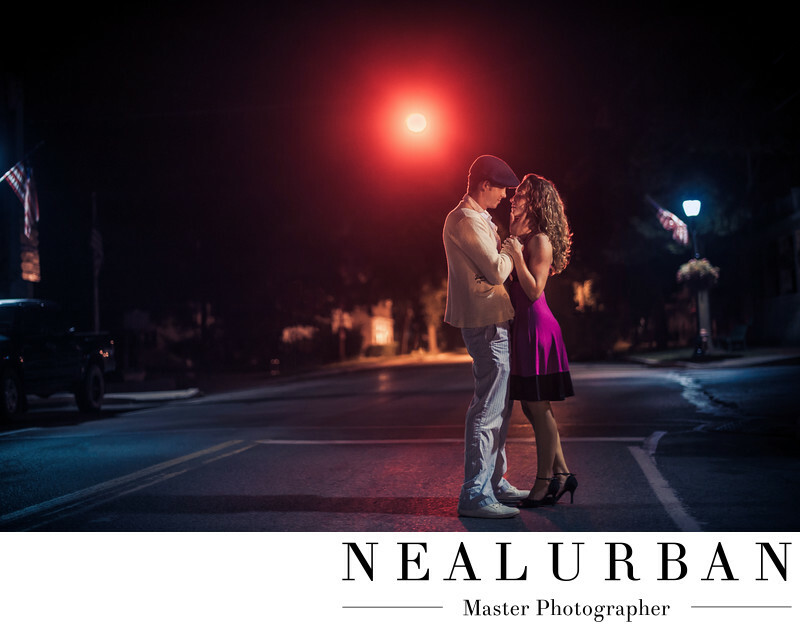 Shannon and Paul had a great idea for their engagement session. They wanted to do a Notebook (movie) themed session. They sent over the outfits they found on Etsy and we had the perfect location to fit this style. We started out at the beach at Fort Niagara State Park. Shannon had the cutest polkadot bathing suit. This part of the session was so playful. We had them walk in the water and used as many areas of the beach we could. We really needed the next part of the engagement session to be dark outside. We went into a local pub and had a light dinner with them and chatted about the wedding day. Once it got dark, we worked around the Village. We used the local ice cream shop window for some fun portraits. The Jug bar and restaurant had nice stone texture we used as well. Then there is the only stop light! Just like in the movie! Youngstown is such a small Village, we did not think it would be too difficult to do this shot. Well, everyone must have been out and about that night and we had to keep yelling out "car" and get out of the street. We originally had a light behind them, but we had to take it out too many times and reset for the cars. We noticed in camera we were getting enough back light from the red street light. Now, we just had to time the blinking of the light. That was fun! We did use one light to light up the front of them. Shannon and Paul were both into acting and modeling, so they knew the posing and idea we were looking for. We only told them where to stand and let the moments happen. I love how you can see a bit of the American Flags on both sides of the image too! This was such a fun and different kind of engagement session. We loved it so much, we had an engagement album sample made to show new clients how fun and creative they can get. If they give us their style, we can find the perfect location for it!